Netflix gets all the hype when it comes to cable-killing Internet video, but Internet superchannel Ustream might be a better model for the next online cable network. Founded in 2007, Ustream offers an array of shows, both live and recorded, as well as Internet channels from some of our favorite brands and celebrities. The company has offices Los Angeles, Tokyo and Budapest. Ustream Asia launched in 2010. From CBS and TMZ to more specific interests like Campaign 2012 — or genre-specific channels like TechCrunch or Leo Leporte Live, a technology-focused show by popular tech reporter Leo Leporte of Tech TV fame — Ustream has a channel for every interest. 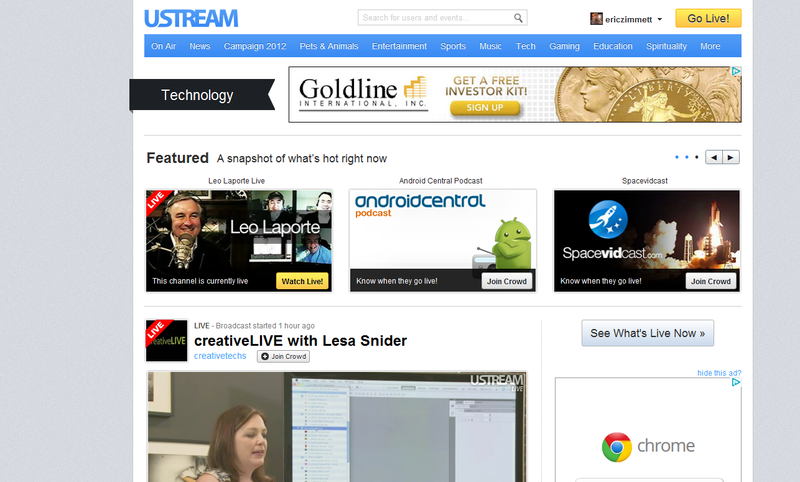 Ustream offers 12 categories on the dashboard including On Air — happening Live — News, Campaign 2012, Pets & Animals, Entertainment, Sports, Music, Tech, Gaming, Education, Spirituality and More. Each category lists available channels. The Tech Category for example — one of my favorites — displays featured channels as well as Live channels In the below screenshot you’ll see three featured channels: Leo Leporte Live, Android Central as well as Space Vid Cast. NASA also offers a Ustream channels. Ustream’s categories and channels are like networks and shows on a typical cable network. In fact, many popular network broadcasts, like the 2011 Emmy Awards, are simulcast on Ustream. After a show broadcasts live on Ustream, content can be archived. Though not all live shows offer this feature. Users can view the channels live, view recorded programs or click “Join Crowd” which essentially adds the channel to the user’s favorites. Ustream’s Mission: “to bring people together around shared interests for amazing live, interactive experiences that build and maintain relationships” (Ustream.tv/about). When streaming on a computer, users can communicate with both the show and other Ustreamers during a live stream. Some televisions are now incorporating a Twitter feed to foster interactivity through social media. On Ustream, social media interactivity is intrinsic to its design. On pay-TV — not distributed through an Internet connection — social media can seem forced or out of place. Flip on ESPN on DirecTV for five minutes and see how many times they drop “Twitter.” It feels forced almost every time. When video content is distributed via the Internet –whether on a computer or on a television — social media chatter is second nature; it’s a part of the experience. And the possibilities for advertisers are obvious. Purchases and more information are only one click away. It’s tie-in with social media like Facebook and Twitter also allows for instantaneous updates on what’s streaming Live and what’s upcoming. Users can get in on the fun, too, as Ustream allows anyone to start an Internet channel and “Go Live!” by broadcasting via webcam. Even Anderson Cooper has a Ustream Channel. In less than four years, Ustream has successfully incorporated everything pay-TV is still trying to perfect: content, connectivity — across an array of devices — and completely natural interactivity.